Secret Invasion: Who Can You Trust? 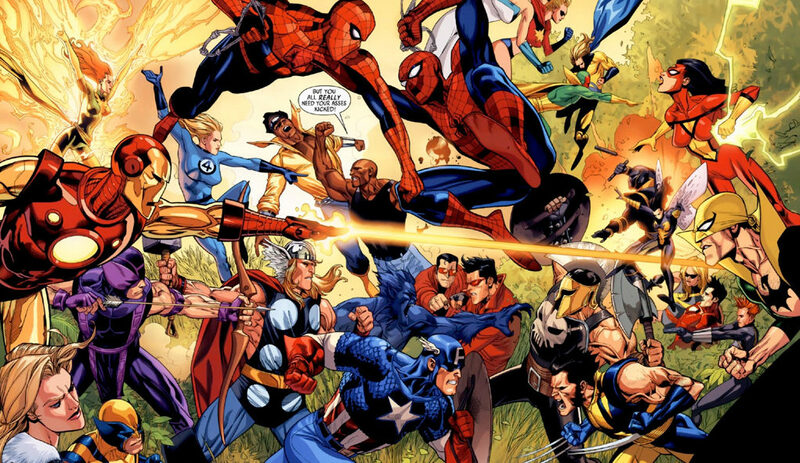 After Avengers Disassembled, writer Brian Michael Bendis and his New Avengers introduced a strain of mystery and unrest at the heart of the Marvel Universe. Something was rotting deep in the heart of Marvel, and after the catastrophic events of Civil War that rot unveils itself in the form of Secret Invasion. Which isn’t to say Secret Invasion is rotten. Although you could easily make a case that the intrigue leading up to the event is Marvel’s true success, Secret Invasion itself has plenty of monumental moments that deeply affect the next phases of the Marvel U. Couple that with some heady political overtones (who’s the real enemy in the age of terror?) and Secret Invasion offers plenty to think about. Like Civil War before it, Secret Invasion continues the theme of increased tie-in issues, and you’ll see that reflected below. The complete collection of Secret Invasion related trades is ordered first, followed by an issue-by-issue reading order for the more OCD members of the group. As always, hope you enjoy! If you have questions, concerns, or contentions, let me hear about it. The Illuminati issues are not included in the issue-by-issue breakdown below, but they play a MAJOR role in setting up Secret Invasion. It’s also one of my favorite Bendis penned books of the last decade. For the truly Secret Invasion focused, read only the first and last issues of the trade. The Home Invasion inclusion here is a bit of a stretch. This arc was a ‘tie-in’ webcomic that ran over the course of Secret Invasion. I won’t be including the rest of the issues in the order, but if you’re interested, you can check out the full trade here. How is Layla (the girl who knows things) around to be recruited by Quake/Fury for the New Commandos? I thought she just got lost in the future during the Messiah Complex and such. Maybe some more X-Men events need to be read before Secret Invasion? If one buys the omnibus, what omnibus should read before and what to read after? Brilliant job with the list and past lists, such a big help with the bigger story arcs. However, I was wondering if there is a book that covers a chunk of this story, like the five hardcovers that cover all of civil war. Thanks so much for making these lists. I have started to read Secret Invasion, New Avengers and Mighty Avengers following the issue-by-issue reading order above. It seems right to use the issue-by-issue approach for these stories by Bendis and three storylines are acceptable to read in parallel. However, there are many more issues and I have especially noted that Captain Britain & MI13 is part of the Best 100 list. Which additional stories are good and essential? Which stories can be read after completing the Bendis storylines of Secret Invasion, New Avengers and Mighty Avengers? When should I read Captain Britain & MI13, after or in parallel? I noticed something that might be a spoiler, depending on how you look at it. The list shows Frontline 5 before secret invasion 8, which has the “final shot” in each. So, in my opinion it would be better to read secret invasion 8 first. It just seems like when I read it, I already knew who kinda finished the battle. To be honest, though, I wasn’t really a fan of this event. Except for the Inhumans trade, which was awesome. Also the nova/gotg. Really, they could have done more with the skrulls, and I know that sounds stupid, but they were basically shape shifting zombies. Plus- bendis always seems to force spiderman characters where they don’t belong and the ending reeks of this. Thanks for the feedback, I’ve updated the list! I admit that I am mostly only interested in stories that include Thor and Asgard, but I still want to have a good idea what’s going on in general as well (as much as my money allows me anyway). You could do that. New Avengers (especially the issues leading up to Secret Invasion) is the biggest player in terms of related continuity. Mighty Avengers would be the runner-up. But in general, Secret Invasion isn’t a very thor-centric story, so you could definitely stick to those three and move towards Dark Reign and Siege. Hiya, First of all, thank you for this great website. I am a complete novice to comic reading and your website has helped me immensely 🙂 Secondly, about secret invasion reading list, or your reading lists in general. There are some characters I do not like to read (mainly the smaller characters). Could I just remove those mini tie in stories and still be able to read the main story arc cohesively using the tie in’s I like (such as spiderman, x-men, ironman etc)? Shortly, I would say yes, especially during Secret Invasion – just don’t skip Thunderbolts. Is the Thunderbolts’ side story pivotal to the Secret Invasion story arc, or just a good side story to read? Wouldn’t say pivotal but more than just a good story arc. Somewhere in between. Also, don’t skip Avengers The Initiative during Secret Invasion. It’s pretty good. One complaint/suggestion about the issue by issue guide. I don’t see the reason to separate some of the tie ins like Ms Marvel, FF and Black Panther. They don’t give spoilers to the main event and could and imo should be read one after the other. It gives much better cohesion and flow to those individual stories. I think that’s fair. I often prefer to read stories as part of a whole that way. Definitely the case in my more recent orders like original sin and axis. Where do the Secret Invasion: Thunderbolts fall into the list? They’re there. Under the Dark Avengers. I just contacted Dave on Twitter regarding this so I guess hell correct it (funny enough the links lead to the Thunderbolts). Yeah those issues used to be Dark Avengers on Marvel Unlimited since those series are connected. Thanks for highlighting, I’ll need to update. There is an additional short story line between The Initiative and Secret Invasion; “Secret Invasion – The Infiltration”. The first one covers between FF 551 to 553, Captain Marvel 1 to 5, Mighty Avengers 7 to 9, New Avengers 38 and 39, and Ms. Marvel 25 to 27. There’s also Secret Invasion, The Prologue, a seven page web comic that ties in directly with Secret Invasion #1. Hey, thanks for the guide, really helping me navigate Marvel U.
I was just wondering where New Avengers 38 & 39 fit into this guide, the trade has them in and the civil war – secret war guide ends at 37. Both issues work as prologue before Secret Invasion #1. You don’t have a Trade for Iron Man in your trade reading order. Oops, my mistake, it is in the War Machine trade. I don’t see Guardians of the Galaxy though. Good call – guide is updated!